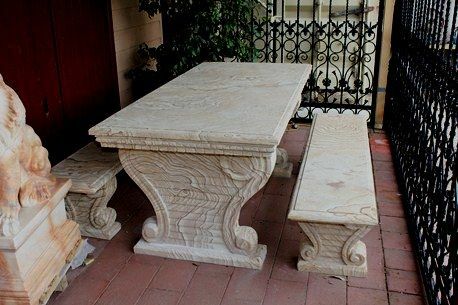 Sand Stone Garden Table with 2 Matching Benches. Stunning Quality Sand Stone Garden Table with 2 Matching Benches. Table 185cm long x 90cm wide x80cm high,Benches 170cm long x 40cm wide x43cm high. Total weight 3200kgs.